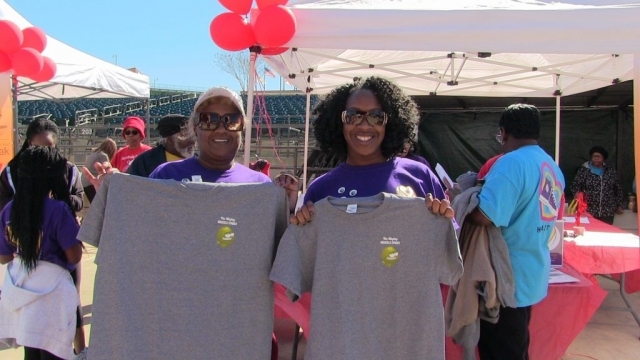 Saving Lives, an outreach program of UA’s Center for Community-Based Partnerships, took part in this year’s Tuscaloosa Heart Walk sponsored by the American Heart Association on Saturday, March 3. Saving Lives volunteers, led by Dr. Nicole B. Prewitt, CCBP’s director of programs and partnerships for community engagement, successfully advanced Saving Lives’ mission of providing health information and promotion, nutrition, and physical activity to participants and their families and friends throughout West Alabama. The annual 5k began at the Tuscaloosa Amphitheater with check-in and fun activities promoting various healthy life styles from flash mob, cardiopulmonary resuscitation (CPR) demonstrations, healthy snacks and warm-up dances led by UA mascot Big Al. Saving Lives volunteers also spent the early morning educating and encouraging healthy eating and life style using props, giveaways and handouts to people visiting the Saving Lives tent. Approximately 40 Saving Lives members and 115 participants interacted with the Saving Lives team. Annette Harris, who goes to Benville Missionary Baptist Church, a Saving Lives member church, has been participating in the Heart Walk for several years. “I enjoy Saving Lives,” Harris said, “because it’s a positive way to give back to the community, because it starts in the church, and it gets church involved to reach out to the community. “Even one person makes the difference,” she said. “Saving Lives is a tremendous help to our church and so we try to branch out. I have been trying to lead a healthy life style, try to eat healthy, exercise, mentally keep myself ready and stay focused. Today, at first I wasn’t ready, but they prepared us (before the walk) and it was good. I did all the challenges and won the T-shirt!” (for eating Brussels sprouts at all four stations). 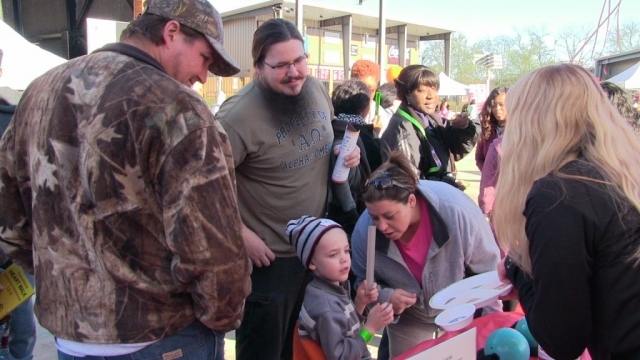 Saving Lives has been participating in Tuscaloosa Heart Walk since 2015. This year, Saving Lives raised $750 for the Heart Walk, adding to $205,300 raised in total for the 2018 Tuscaloosa Heart Walk. This year’s American Heart Association goal for Tuscaloosa was $250,000. More than 500 participants registered for the 5k, walking to honor survivors of cardiovascular disease and stroke in the community. Saving Lives will be a part of next year’s Heart Walk and in the meantime will be recruiting and training more church members and attending promotional activities such as Holt High School Health Fair on Saturday, March 24.